Should You Declaw Your Cat? When the urge to scratch strikes, your cat doesn't wait to find a surface you find acceptable. As far as your furry friend is concerned, couches, carpets, table legs, and your favorite draperies provide excellent scratching surfaces. If you're tired of replacing shredded furniture and expensive draperies, you may be considering declawing your cat. Although the surgery will end the habit, it's not the first choice recommended by veterinary experts. Territory Marking. Marking territory is an instinctive behavior that occurs whether a cat lives in indoors or outdoors. Scratching leaves behind your cat's scent behind and also provides a visible reminder to other animals. Nail Maintenance. Scratching helps your cat sharpen its nails and get rid of old nail husks. Stretching. Your pet fully extends its body when scratching, which stretches muscles and keeps them limber. What Happens When a Cat is Declawed? Declawing doesn't just remove your cat's nails but also eliminates the first joint in each bone. During surgery, the joints are amputated using a blade or laser. The American Veterinary Medical Association advises that declawing is major surgery and should only be performed after owners' have tried to stop the scratching or if the behavior presents a health risk for them. Infections. It's difficult to keep surgical sites clean when they involve the feet. Your cat will be exposed to bacteria simply by walking across the floor or using the litter box. Although antibiotics can be helpful, infections that threaten your cat's health can develop following surgery. Gait Change or Difficulty Walking. Declawing can alter the way your cat walks. A change in gait may affect the alignment of your pet's bones and lead to chronic back pain. In a study published in the Journal of Feline Medicine and Surgery, declawed cats were more likely to experience back pain than those who hadn't been declawed. Pain was more likely if bone fragments had been left behind in the paws. Litter Box Issues. Scratching and digging, essential litter box behaviors, can be painful after surgery. If your cat finds the litter box too painful, it may decide to use the corner of a room or other secluded location as a litter box alternative. If your cat associates the box with pain, retraining it to use the litter box can be challenging. Chronic Pain. Pain can occur if nerves were damaged during declawing surgery or the veterinarian removed too little bone or damaged the paw pads. If too much tissue or bone is accidentally removed, your pet may become lame. Behavior Changes. Declawing may also cause permanent changes in your pet's behavior. Declawed cats with retained bone fragments were more likely to be aggressive, according to the Journal of Feline Medicine and Surgery study. Vulnerability. Nails provide protection from predators. If your indoors-only cat happens to sneak outside one day, it won't be able to climb a tree to escape an attack or even fight back effectively. How Can I Stop My Cat From Scratching? Offer Alternative Surfaces. Scratching posts and pads, whether store-bought or homemade, give your pet an acceptable place to scratch. You'll need more than one of them, particularly if you have multiple cats. Choose posts that are long enough to allow your cat to stretch fully and don't move when scratched. Protect Furniture. Wrapping the corners of upholstered furniture with foil, plastic wrap or double-sided tape can make these surfaces unappealing. Use Nail Caps. Soft vinyl nail caps are placed over your pet's nails. Although your cat will still scratch, scratching won't cause any damage. You'll need to replace the caps after about a month. Trim Nails. Trimming nails every one or two weeks blunts the ends and reduces damage from scratching. Try Pheromone Spray. 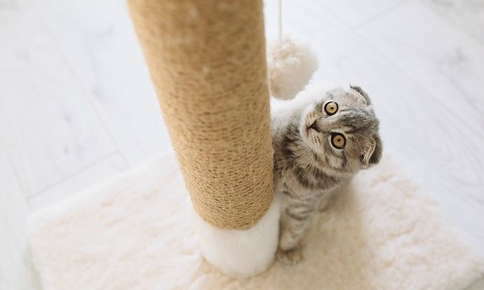 Place a few drops off the spray on scratching posts to make them more attractive to your pet. Are you having a hard time controlling your cat's scratching? We can help. Contact us for suggestions, or schedule an appointment to discuss scratching and other behavioral issues.